For people with disabilities, a dog can be much more than a pet. They can provide important help, ensuring individuals who face physical and mental challenges are able to maintain their independence and live active lives. Known most commonly as assistance dogs, these pups help their owners with everyday tasks, offer comfort, and give support in times of stress. If you’ve wondered how your dog can become a helping hand for you or someone else in need, here’s what you need to know about the different ways to register and train your dog. Jobs for these dogs vary depending on their owners’ needs. 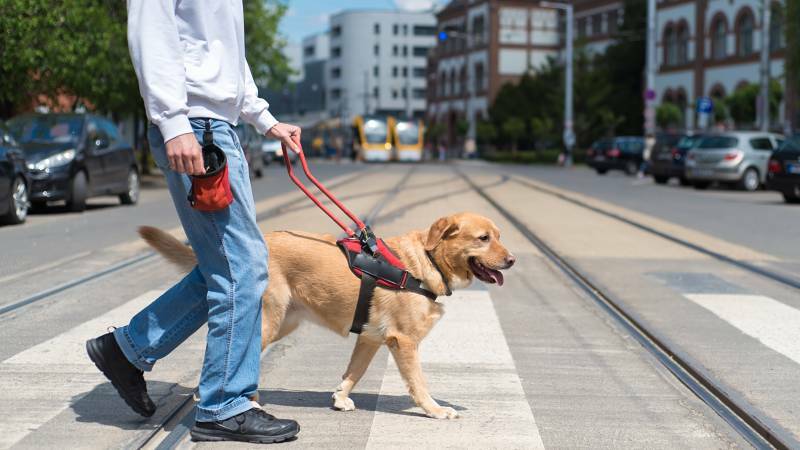 Well-trained and certified by accredited organizations, assistance dogs may turn lights on and off, open and close doors, help people walk, and alert people to potential health dangers like low blood sugar or oncoming seizures. Because the services of these dogs are essential, they’re covered under the U.K. Equality Act of 2010 (EA). According to this law, business owners and public facilities must make “reasonable adjustments” to accommodate individuals with disabilities. This includes granting service dogs entry to places where animals aren’t usually allowed and providing transportation via taxi and minicab to owners with their companions. Airlines also grant free passage to service dogs. For a dog to qualify for these benefits in the U.K., it must be trained and certified through Assistance Dogs International (ADI) or the International Guide Dog Foundation (IGDF). Organizations belonging to Assistance Dogs U.K. (ADUK) have all been accredited by these two groups and are acceptable channels through which obtain service animals. Emotional support dogs aren’t required to have special training. This has created some confusion in recent years, and not all countries have yet come to accept the idea of emotional support animals (ESAs) as legitimate. The U.K. is currently one of these countries. Unless a dog is certified as an assistance dog by the ADI or the IGDF, it isn’t recognized as a service animal, including an ESA. This prevents these animals from being allowed to live in “no-pet” housing, and ESA owners cannot bring their dogs into an airplane cabin when traveling. Until the U.K. adopts a policy for accreditation or certification of ESAs, these laws and regulations are likely to stay in place. You also need to beware of online services offering to “register” your dog as an ESA. Both within and outside the U.K., there is no such system of registration. The only way for a dog to be approved as a companion for emotional support is to obtain an ESA letter from a licensed mental health professional. Therapy dogs are neither service dogs nor emotional support dogs. Instead, these animals benefit “people in a therapeutic way,” according to the U.K.’s Private Therapy Clinic. Therapy dogs require training to prepare them for the highly social nature of their jobs, including rigorous obedience training. Unlike assistance animals, which may become distracted from their jobs if they interact with others without permission from their owners, dogs performing therapy roles are encouraged to make contact with those whom they serve. Therapy dogs act as companions in specific settings, such as hospitals, schools, nursing homes, or therapy offices. In these facilities, the animals interact with people in a variety of situations, including those suffering from illness, dementia, Alzheimer’s, trauma, injury or psychological distress. Some therapy dogs work with disabled children to provide encouragement and confidence as they learn important skills like reading. If you train therapy dogs or volunteer with organizations bringing these animals into facilities, it’s important to know you can’t take your dog with you the same way a person with an assistance dog can. You have to contact the locations where you’d like your dog to provide services and discuss their policies beforehand. Consider getting your dog registered and trained now – as an assistance dog, an emotional support dog, or a therapy dog. Although there are different requirements and different laws, often the first step is working with your dog to adapt to supporting you in different places and settings. The process is easier than most people think, and it’s just a matter of starting on the path. You can research before you begin. An online search can teach you about the process, its requirements, and the options available to you. Interested in registering your dog as an assistance dog? Start a search today.